Over the past eight weeks, I’ve worked hard to recommit myself to a healthy lifestyle, and my new vision board has been key to my success. What is a vision board? A collage of words and images that helps you visualize your goals and dreams so you can move closer to making them reality. 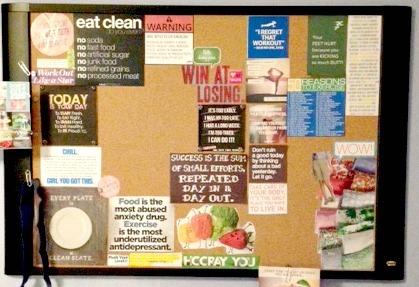 I actually consider mine more of an “inspiration” or “motivation” board, as the pictures and graphics provide a daily reminder of the reasons I am rededicating myself to a healthy lifestyle, including clean eating and regular exercise. Mine consists of a large Post-It cork board placed on the wall at the foot of my bed, a place that I can’t help but see it every morning and every night. I especially love the bold graphics that grab me from a distance. I happened to love the large self-stick cork board, but your vision board doesn’t have to be as fancy; you can create it on any size bulletin board, poster paper or even online. The important thing is that you use images that motivate you and accurately picture your goals and/or dreams. Do you have a vision board? If so, how has it helped you? Describe your vision board, and please share any helpful links about creating one. If you don’t have a vision board, is it something you’d like to do? This entry was posted in Advice, Health, Mary Pat Baldauf and tagged Columbia, columbia sc, every woman blog, Famously Hot, hospital blog, Lexington, lexington medical center., lexington sc, Lexington Women, lmc, LMC every woman blogger, mary pat baldauf, Midlands, Midlands Women, South Carolina, South Carolina Women, Women, women's blog, women's hospital blog by Kate Gillmer. Bookmark the permalink.